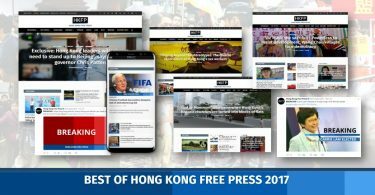 In December 2017, Hong Kong’s pro-democracy lawmakers – who were six members short after some were ousted by the courts – fought a lost cause to prevent their pro-Beijing colleagues from changing the legislature’s house rules. Henceforth it would become much harder to filibuster controversial bills. See also: Part I: The rise and fall of the 2003 national security bill. “Today [they] amend the Rules of Procedure, tomorrow [they’ll] enact Article 23 laws,” they shouted, tying themselves to chairs in a desperate bid to halt the changes. The Rules of Procedure amendment protests. Photo: In-Media. Two weeks later, Beijing’s legislature issued an unprecedented legal document authorising mainland Chinese laws to be implemented in a high-speed railway checkpoint in West Kowloon – despite fears that such an arrangement was unconstitutional. 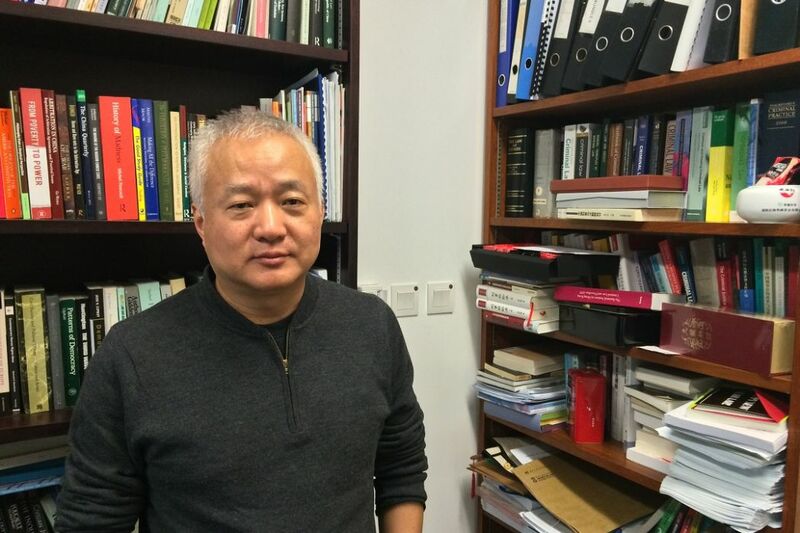 Hong Kong University law professor Eric Cheung speculated that the motive for this document was to strip Hong Kong courts of their oversight of the arrangement. He added that Beijing may do the same thing to stop future Article 23 national security laws from being judged unconstitutional for any violations of protected rights and freedoms. “I’ve never used conspiracy theories to comment on anything… I sincerely hope that history will prove my analysis wrong,” he said last month. Since the failed attempt to pass the National Security (Legislative Provisions) Bill in 2003, pro-establishment politicians have occasionally raised the possibility of reintroducing it. But today’s pan-democrats appear to see Beijing’s every move as paving the way – clearing the constitutional obstacles – for a new national security bill. 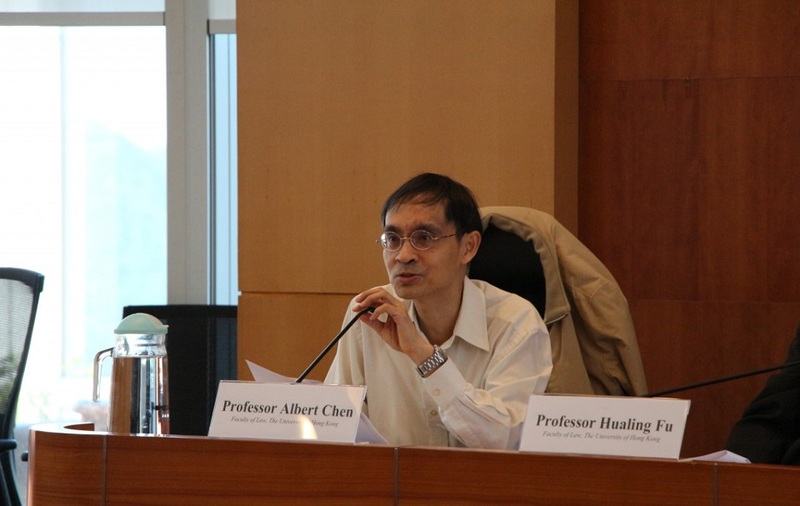 In early December, local and foreign legal scholars gathered at Hong Kong University in a repeat of a conference discussing national security that was last held in June 2003, two weeks before the mass protest that effectively ended the Article 23 saga. That conference had led to a one-day truce at the legislature, as lawmakers and officials alike took their arguments to the university campus. The national security conferences of 2017 and 2003. Photo: Karen Cheung/HKU. 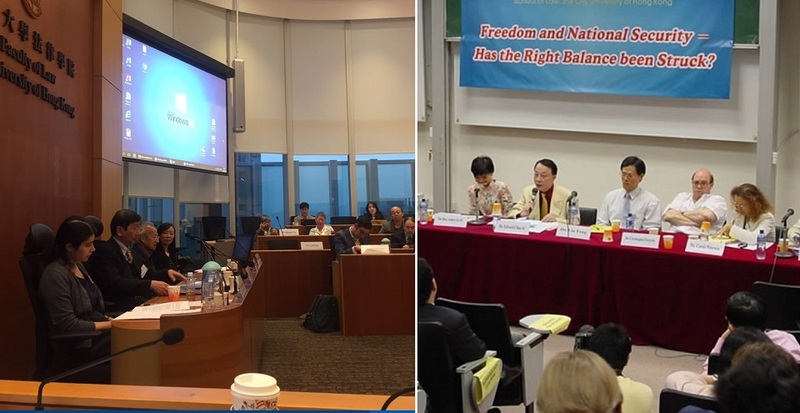 Mainland constitutional law professor Fu Hualing told attendees that in pushing for a national security law, Beijing’s aim is now to suppress Hong Kong’s pro-independence movement. Freedom of speech is expressly protected in the Basic Law as well as the Bill of Rights Ordinance – Hong Kong’s 1991 law which adopted international human rights standards. Fu Hualing. Photo: Elson Tong/HKFP. Under the 2003 national security bill, crimes such as subversion and secession could only be committed through “serious criminal means.” But even the definition of “serious criminal means” had been criticised for being too broad, as it also included acts that involve no violence against humans. (v) seriously interferes with or disrupts an electronic system or an essential service, facility or system (whether public or private). 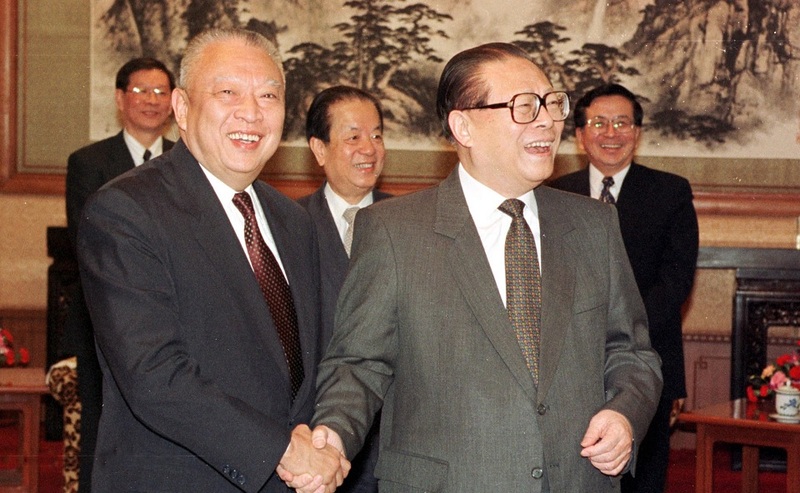 Jiang Zemin and ex-chief executive Tung Chee-hwa. Photo: GovHK. A national security bill only requires the support of a simple majority in the legislature to be voted into law. The pro-Beijing camp has always obtained over half of the seats. Therefore, few legislative obstacles exist to the passing of a law that would criminalise mere speech. However, Hong Kong University criminal law professor Simon Young told HKFP that the courts can refuse to enforce vague or otherwise unconstitutional laws. “The second thing that they can do is [to say] that there are provisions or aspects of the law that violate specific constitutional rights, whether it’s the freedom of expression or the presumption of innocence.” A judge would then either strike down the provision, or employ more lenient legal tests favouring the accused. Whether these general principles still apply when Beijing intervenes is not so clear. Cheung viewed Beijing’s joint checkpoint document as a way of subjugating the courts. His colleague Albert Chen told attendees at the December conference that under Article 17 of the Basic Law, the National People’s Congress Standing Committee (NPCSC) might invalidate a Hong Kong security law and ask for new legislation if it deems the provisions unsatisfactory. “But why use Article 17 when you can use Article 158?” asked former legislator Margaret Ng at the conference. Under Article 158, the NPCSC has the power to issue binding final interpretations of the Basic Law upon Hong Kong courts. Albert Chen at the conference. Photo: Citizen News. 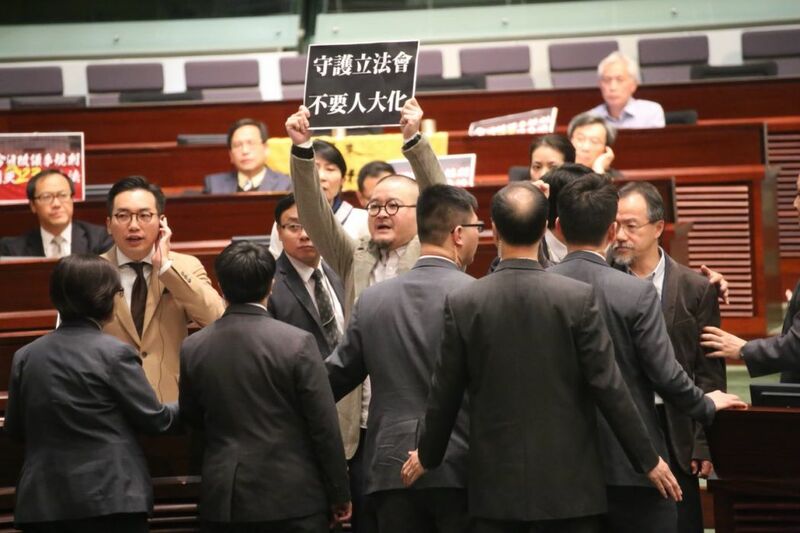 The NPCSC most recently did so in 2016 to bar six opposition Hong Kong lawmakers from office because their oaths were not “solemn” and “sincere” enough. The courts did not challenge the decision. But in the early days of the 1997 Handover, the Court of Final Appeal once attempted to challenge Beijing. Flooded with lawsuits by mainland children arguing they were eligible for local residency against the government’s wishes, its five justices wrote in a famous judgement that they could declare an NPCSC decision invalid, if that decision was inconsistent with the Basic Law. Beijing was outraged, and the Hong Kong government demanded a clarification. The court issued a somewhat ambiguous statement, which appeared to dodge the question of what exactly it would do if Beijing acted unconstitutionally. …Nor did the Court’s judgment question, and the Court accepts that it cannot question, the authority of the National People’s Congress or the Standing Committee to do any act which is in accordance with the provisions of the Basic Law and the procedure therein. 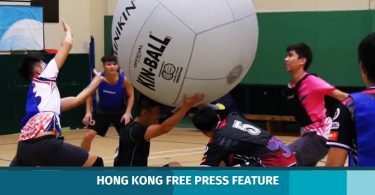 In this context, government figures including advisor Ronny Tong and former chief executive candidate John Tsang have suggested that a moderate way forward is to enact pro-actively not one, but several, piecemeal Article 23 laws. Tong warned in November that the longer Hong Kong delayed enacting laws, the more willingly Beijing would intervene. 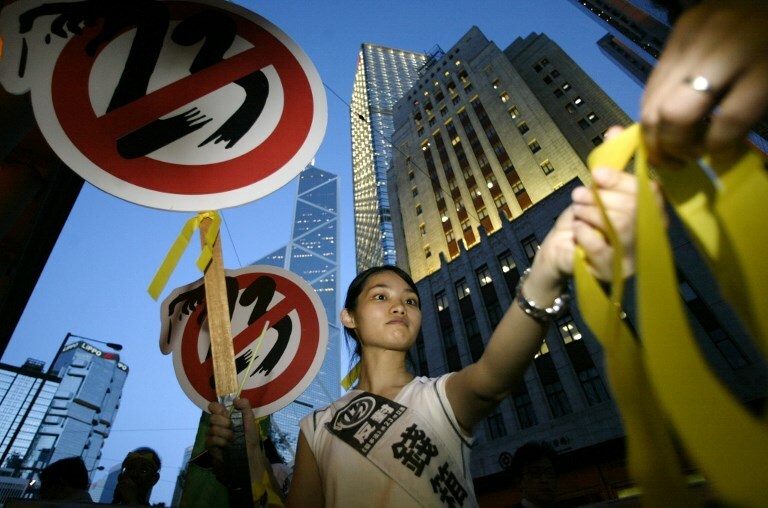 A girl hands out yellow ribbons against the controversial Article 23 law during a protest 09 July 2003. File photo: Peter Parks/AFP. The former pro-democracy lawmaker said that Hong Kong could first deal with the more straightforward offences of treason, secession, sedition and subversion, before moving onto the trickier provisions related to state secrets and foreign interference. In his election platform last February, Tsang added that consultation for both Article 23 and a renewed attempt at achieving universal suffrage could begin at the same time. 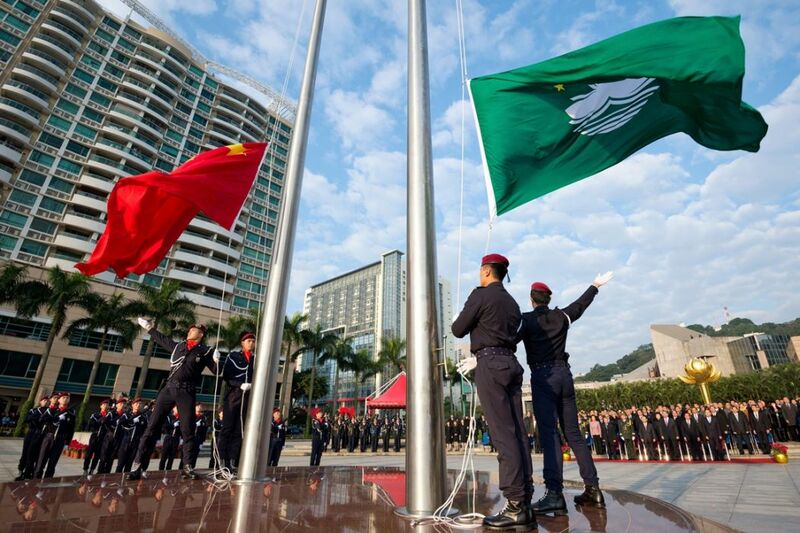 Criminal law scholar Young suggests that Hong Kong should also closely examine Macau’s national security law – which was enacted with little protest in 2009 – to determine what conduct the sister Special Administration Region has not banned. Macau’s laws, for example, do not criminalise the possession of seditious publications. They do not allow the government to ban “subordinates” of organisations banned in mainland China. Both offences had been proposed in Hong Kong’s 2003 bill. Young also points to mainland China’s 2005 Anti-Secession Law, drafted amid tensions with the independence-leaning Chen Shui-bian administration in Taiwan. The law says that military force should only be used when peaceful means towards “national reunification” have been exhausted. Until the day the government re-introduces a national security bill, it remains difficult to speculate upon its content. Constitutional law scholar Fu says that officials will continue throwing out all sorts of proposals in the meantime. 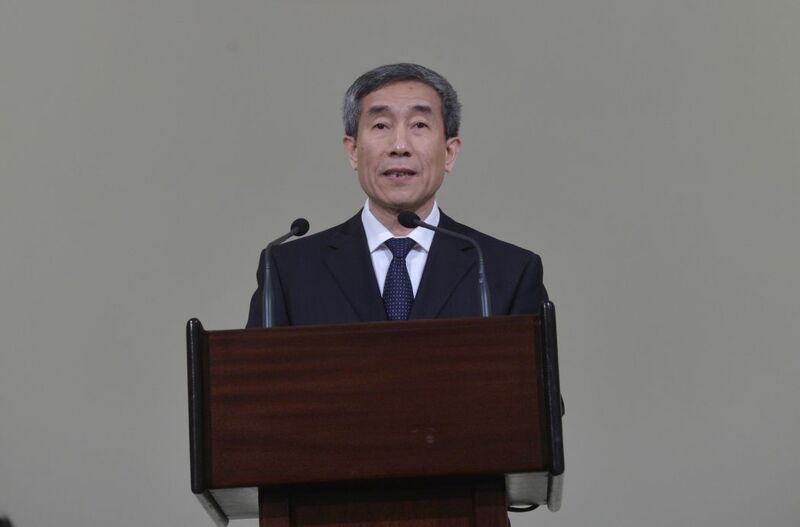 While Li Fei, the legal committee chair of the National People’s Congress, told Hongkongers in a November speech that the absence of Article 23 laws had an “adverse effect” upon the city, President Xi Jinping reportedly did not talk about the matter when visited by Chief Executive Carrie Lam the following month. 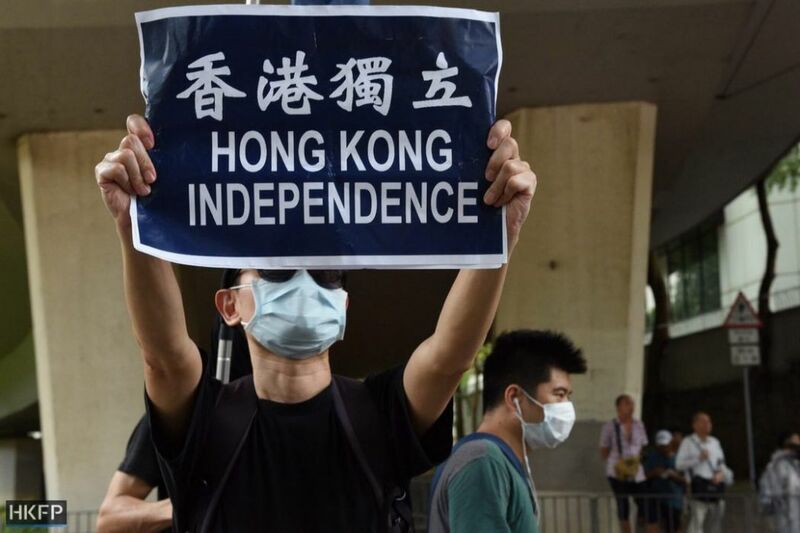 Fifteen years on from 2003, does Hong Kong society still have the energy and unity to mobilise in large numbers against a potentially unreasonable and unconstitutional national security bill?